A rare hurricane, known as a "Medicane" is forming west of Sicily and is forecast to move south, gaining strength, hitting the island of Malta then heading east impacting Greece sometime around Saturday. 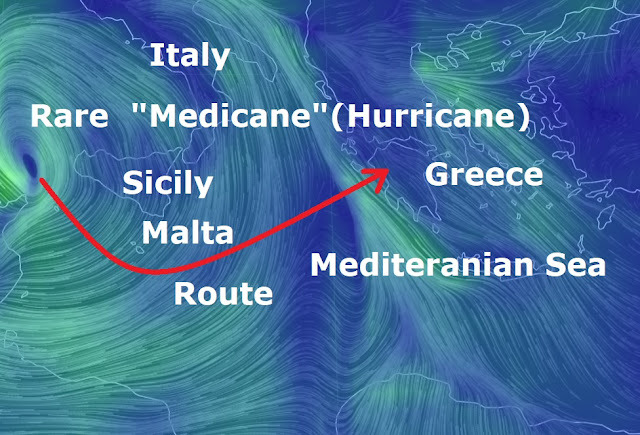 The medicane comes after days of deadly weather in the area. In Greece: Deadly floods hit Mandra, Nea Peramos and Megara killing ten people and washing cars into the sea. Authorities said that about 10 cars were swept into the sea in the Aegean island of Symi on Monday. In Sicily, heavy rains fell in the Ragusa province destroying local greenhouse crops this week. Some areas were hit by actual tornadoes. It will take days to assess the damage. In addition to the collapsed greenhouses, operators also have to deal with flooded crops. At least 38 people were injured in the tornado in Turkey's southern Antalya Province late Monday, Dogan News Agency reported Tuesday. The tornado, which moved swiftly towards the land from the sea, hit the farming fields and uprooted trees particularly in areas close to the coastline, according to the report. The heavy storm and rainfall left a large-scale damage in the areas. And greenhouses, houses and vehicles were destroyed.